Okay, the Daredevil onslaught has begun! Today saw the release of Daredevil #3 and New Avengers #16 (an issue devoted almost entirely to Daredevil) and as early as next week we’ll see Daredevil #4 hit the stands. I’ll get back to New Avengers tomorrow or Friday, but for right now, let’s take a look at Daredevil #3. When we first meet Daredevil this issue, he’s still stuck in the trap he got himself into last month, surrounded by mysterious and very creepy shadow creatures who are made up of sound (don’t ask me for the science behind this one…). 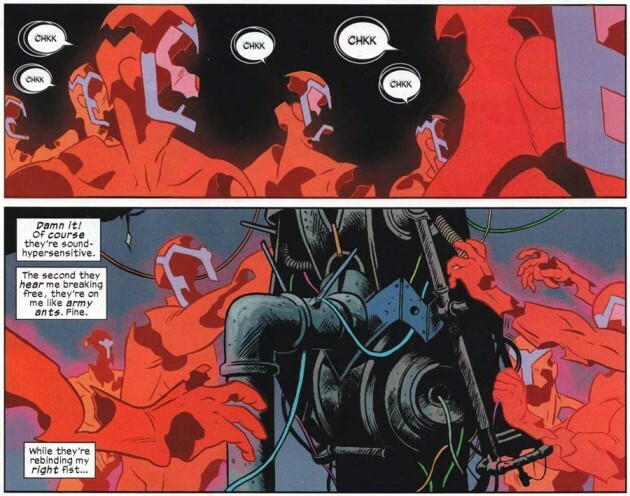 Their master shows up just as Daredevil is able to fully assess his situation and Matt learns what the reader already knows, that he is being held captive by Klaw, the “Master of Sound.” Or, to be precise, a fragment of the currently disembodied original Klaw. Like the Spot in the first issue, Klaw makes for what initially appears to be a goofy choice of villain, but which in the capable hands of Waid and Rivera is transformed into something much more sinister. Rivera does an excellent job of making the fractured sound slaves hovering around Daredevil’s trapped body look truly frightening, almost skeletal, and Waid’s script makes sure the scene reads like something out of The X Files crossed with Criminal Minds, albeit with some obvious superhero overtones (including having the villain of the week give us a full oral report on what exactly brought him to this point). With Klaw’s sound-based powers, we know that he will prove to be a difficult challenge for Daredevil and though parts of the fight scene are hard to follow – oddly enough, I felt that it was missing appropriate sound effects – I was more entertained by the mechanics of this scene than I am by most action scenes. Kudos to Rivera for keeping the scenery changing and things popping. 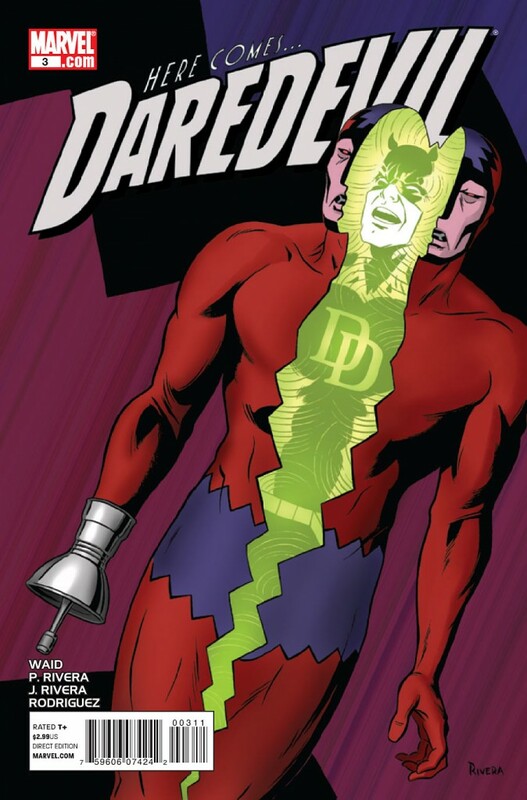 We’re also left with a bit of a (deliberately placed) loose plot thread at the end of Daredevil’s encounter with Klaw that I’m sure we’ll get back to at some point down the line. While Matt finds answers to at least some of his questions, he also finds himself suffering from the physical repercussions of his most recent adventure as he gets back into the office for the last third of the issue. Anyone who’s been at a too loud concert will be familiar with the concept of “threshold shift” which basically makes your hearing worse for a while after the loud noise subsides. In severe cases, it can last up to 48 hours, and this is probably what poor Matt is stuck with as he’s talking extra loud for several pages. This will probably come across as too goofy for some, but I’ve always had a soft spot for the low-powered guys who will not necessarily walk away from every violent encounter completely unscathed. In the course of helping their client, Matt and Foggy (well, mostly Matt) come up with a brilliant idea for how they will get around the Daredevil problem at the law firm and I have to say that this is a rather intriguing idea that will indeed see Matt dealing extensively with legal matters while not having to appear in front of a judge himself. It’s a rather simple solution that Mark Waid has come up with, though it kind of works (provided he can find enough clients willing to go this particular route). All in all, I found this to be a well-paced and very entertaining issue which manages to be both creepy and funny. The art continues to be stellar, and Paolo Rivera will be missed for the next three issues while Marcos Martín takes the reins for an arc. I like that the story manages to tie together the more fantastical elements of Klaw’s plan with the very grounded story of the shopkeeper in a way that makes perfect sense in superhero comics. 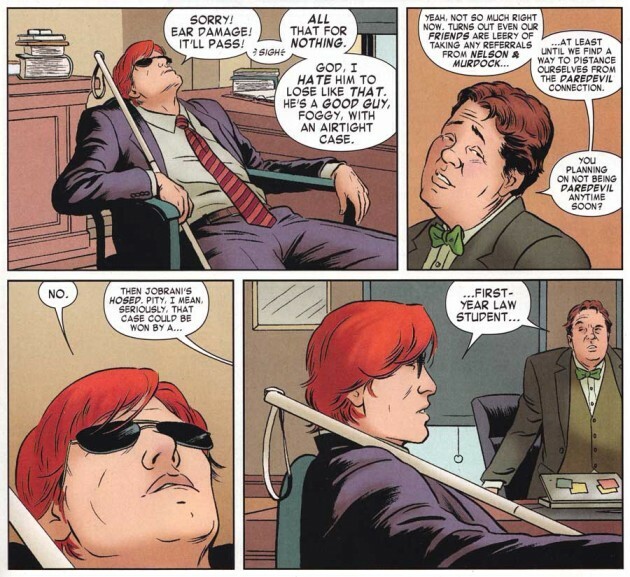 I’m looking forward to next week when we’ll see Daredevil continue to fight crime in costume while Matt and Foggy are looking to hire some staff for their office. Sounds like a great combination to me! One of my favorite details during the DD/Klaw fight were the big sound effects that were blurred out. You can kinda make them out(KRASH, HONK), but its just big white noise, which is all Daredevil can see/hear at the moment. I think that just really adds to the cleverness of this confrontation, how you can play with sound because of the nature of the two characters in combat. No matter how light the tone or colorful the book gets, its still totally Daredevil, or more importantly, totally Matt Murdock, doing things on both sides of his life that really works best with the character. The colorist is really good! Some time ago I opened the Brubaker’s omnibuses and I realized they were all dark and monotone… This guy is way better than the ever-cursing Hollingswort! nothing special happened, in the whole issue he escaped, and gave a dude some legal advice. New Avengers 16, which I read, was actually much better. I’m loving the humor in this book. My wife is actually reading this, and she’s never read monthly comics. She’s read a lot of my DD and Batman trades, and always really liked Daredevil, but she’s a busy lady. We’re both avid readers and I’m always saying “Hey you should read this or that”, and a couple of weeks ago she read DD #1 and 2 after I commented how fun Waid had made DD again. Then this past Thursday she read my copy of #3 before I could.